"Ve believe in nothing. Nothing!" Here we have a silhouette of the three nihilists from the Coen Brothers' masterpiece, The Big Lebowski, right before they get whooped by Walter. The Dude stands by, as does Donnie, outside their favorite bowling alley. Their chosen mascot, the angry ferret (marmot? ), towers over them in all its glory. A great shirt for Lebowski fans/fests everywhere! Nihilist: Ve vant ze money, Lebowski. Nihilist #2: Ja, uzzervize ve kill ze girl. Nihilist #3: Ja, it seems you have forgotten our little deal, Lebowski. The Dude: You don't HAVE the f***ing girl, dipsh*ts! We know you never did! Donny: Are these the Nazis, Walter? Walter Sobchak: No, Donny, these men are cowards, there's nothing to be afraid of. Nihilist: Ve don't care. Ve still vant ze money, Lebowski, or we f*** you up. Walter Sobchak: F*** you. F*** the three of you. The Dude: Hey, cool it Walter. Walter Sobchak: No, without a hostage, there is no ransom. That's what ransom is. Those are the f***ing rules. Nihilist #2: His girlfriend gave up her toe! 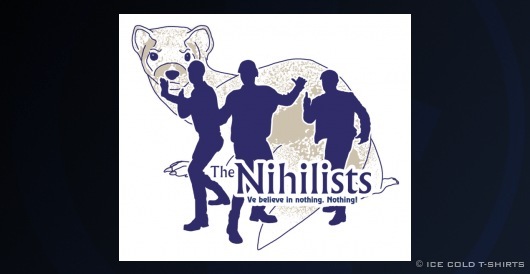 Nihilist #3: She thought we'd be getting million dollars! Nihilist #2: Iss not fair! Walter Sobchak: Fair! WHO'S THE F***ING NIHILIST HERE! WHAT ARE YOU, A BUNCH OF F***ING CRYBABIES?